There are a lot of homemade Nutella recipes out there, and to be fair-most of them are actually probably closer to the store-bought. But I really just wanted a simple, healthier, chocolate hazelnut version. 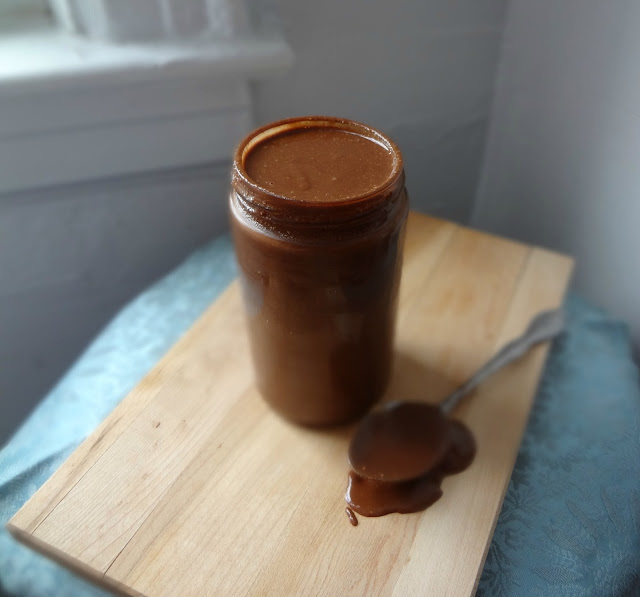 I asked various people about if I couldn't just make it the way I make any other chocolate nut butter, but I was told it wouldn't work, I needed to use cocoa powder, etc. Well ta-da! I did it! I just took some roasted, skinned, hazelnuts and processed them. Then I threw in some dark chocolate chips and a dash of salt. Process until smooth, refrigerate, and done! YUM. 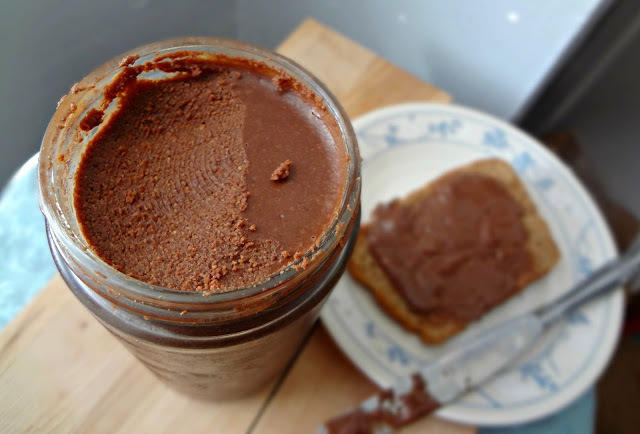 You know those Nutella commercials where the mom is spreading it on toast and talking about how it's a healthier option for her kids (you know, the kind of stuff that got them sued)? Well...this is actually pretty healthy (I mean..dark chocolate is kindaaaa healthy). And I spread it on whole wheat toast and ate it for breakfast. Just like those kids in the commercial. 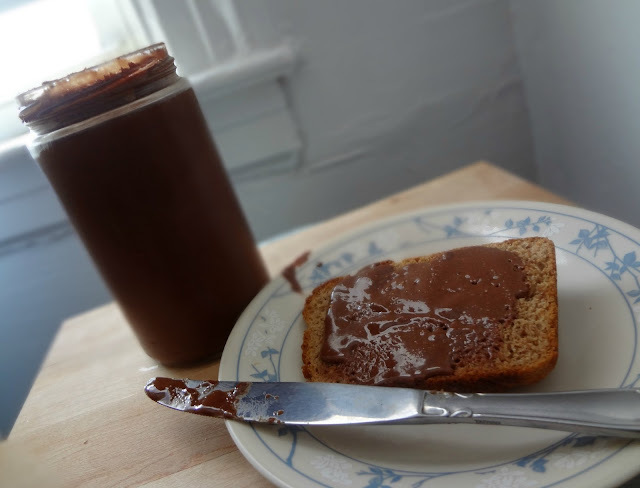 Oddly enough, I had been meaning to try this for awhile but one day, while babysitting, I made myself a toasted Nutella and peanut butter sandwich...and it was just so good I knew I needed to make some for myself ASAP. In summary, this is a spread full of amazing hazelnut-chocolate flavor, you're gonna love it, and to all who doubted me: nananananaaaa. 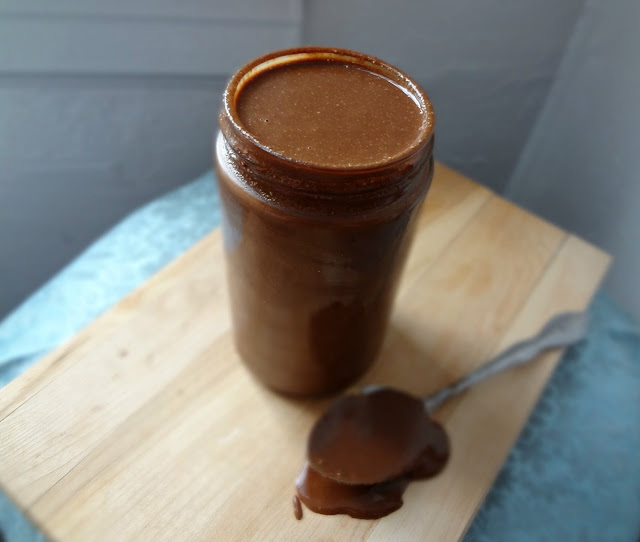 Adapted from homemade peanut butter, dark chocolate walnut butter, and various online sources. 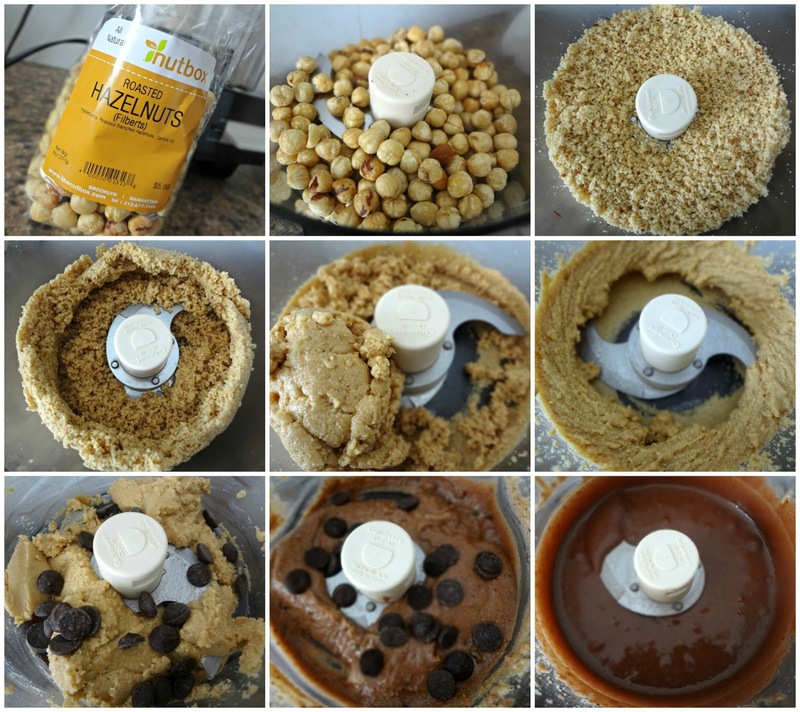 Pour desired amount of hazelnuts into a food processor. Process. 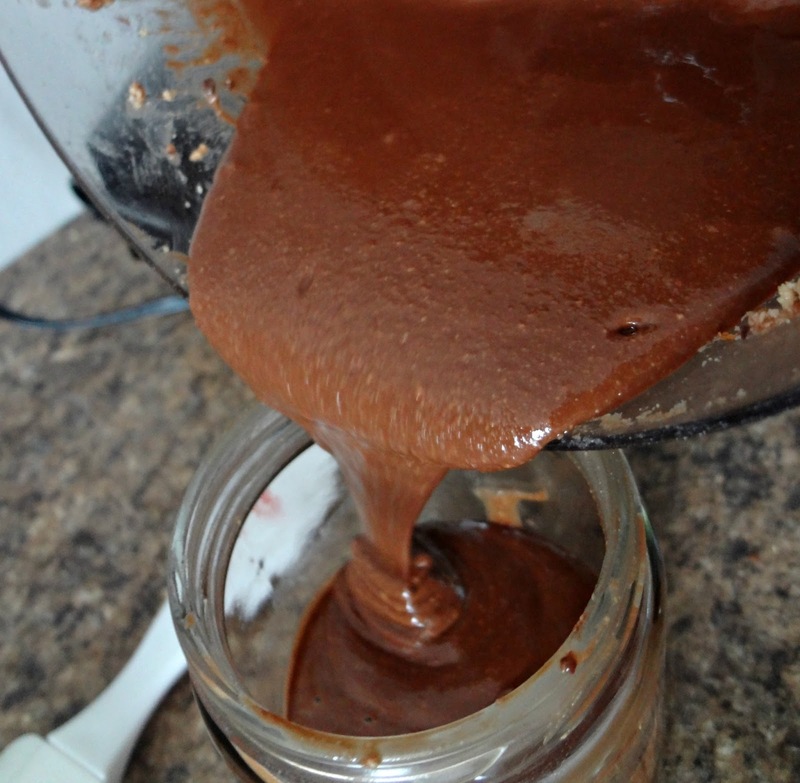 You will see the hazelnuts become ground up, begin to moisten, then form a ball and break down. Scrape down the sides as needed. This process will take around 5 minutes. 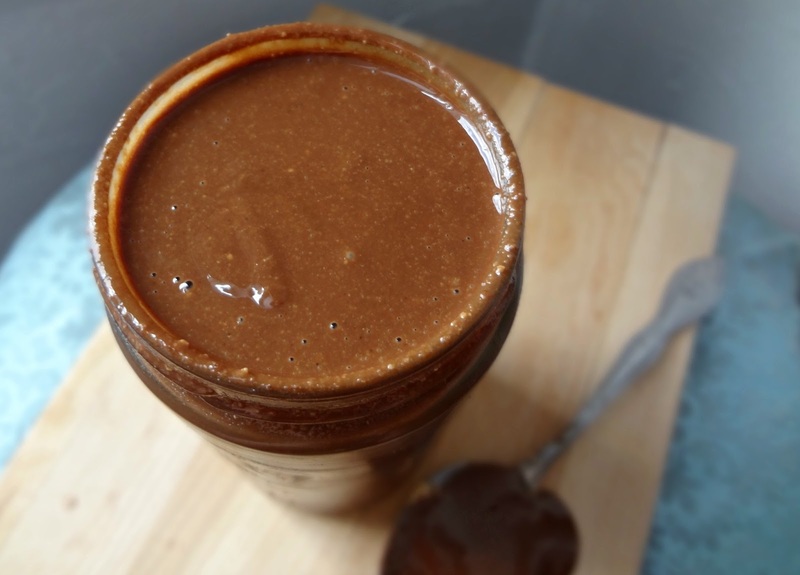 If it seems like they are not forming a nut butter, you can add a little bit of oil as needed, although I did not need to add any oil. After the hazelnuts after formed a ball and started to break down, add in desired amount of chocolate chips-start with a smaller amount, and add more as needed. Continue to process until the chocolate has melted and combined into the hazelnut butter. Taste and add more chocolate chips if needed. You can also add salt at this point if you'd like. Allow to process until it has reached a smooth consistency. Store in an airtight container/jar. Refrigerate immediately after making. Store in the refrigerator (it will keep for about 1 month or so)-or, if you choose to remove from the refrigerator after the first day, it will keep for about a week. I recommend refrigeration.